Timberwise have been providing waterproofing services for over 45 years and we cater for both small residential properties through to large scale waterproofing projects. Converting your basement is a worthwhile investment for any homeowner or commercial property owner. Most people think of a basement to an old, musty storage area or a place for doing laundry. Not only can this part of a building provide an opportunity for creating a new lifestyle it can also add value to a property. 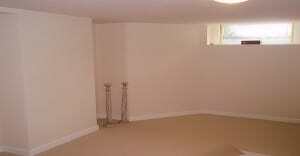 Extra Living Space- Converting your basement will provide additional room for your property. Increase the Property Value- By creating extra living space underground you can increase the value of property significantly. Generate Extra Revenue– From the rental perspective, basement conversion could allow for an extra bedroom which is a great way to increase passive income. At Timberwise we have a team of specialist waterproofing surveyors covering London who hold the industry standard CSSW qualification (Certified Surveyor in Structural Waterproofing). 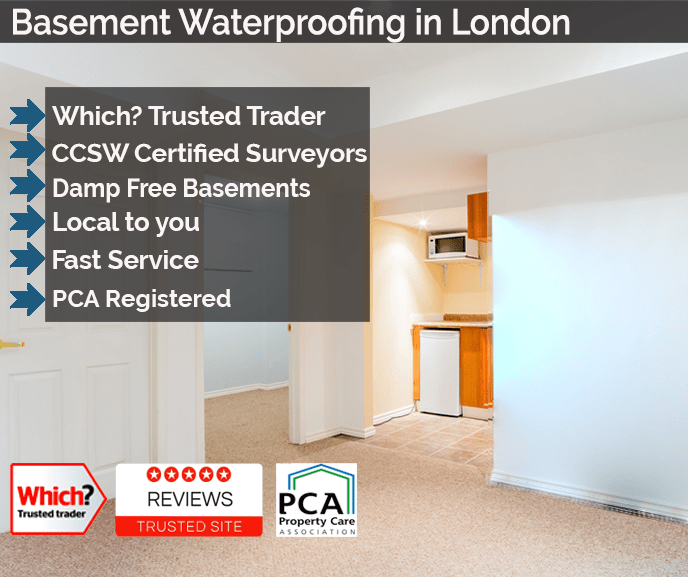 As converting a basement or cellar and waterproofing a basement should be completed by qualified specialists you should always make sure that you use a CSSW qualified surveyor for a waterproofing project. Our team work closely with the property owner to find the best waterproofing solution that is fitted to your situation and that it complies with the BS regulations (BS8102). Our highly skilled basement waterproofing specialists control the ingress and flow of the water to a pre-determined evacuation point by the use of cavity drainage systems. The flow of the water is controlled through a perimeter drainage channel and directed to a suitable drainage point. Once the cavity wall drainage membrane has been fitted, wall surfaces can then be dry lined or plastered on directly. Basement or cellar tanking compared to cavity drainage systems stops the flow of water. 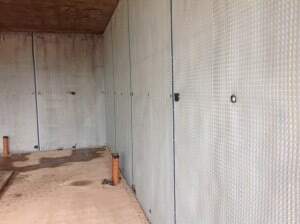 The tanking system works by having a waterproof coating applied directly to the porous cellar walls to prevent water seepage and in turn creates a dry and improved internal environment. The lining (or slurry) is applied to the walls to form a “tank” which creates a barrier to prevent water getting into the building. What happens when the Waterproofing process is completed? Once the waterproofing process has been carried out to the property the customer is left with damp free, dry basement. If you want more information about basement waterproofing or any of our other waterproofing services then click here. There is an ever increasing demand for conversion of damp basements to dry useable areas. By having a survey carried out by Timberwise we can make sure that we can provide a waterproofing solutions that meets the needs of you and your property. If you are having damp problems in your basement and you want to convert it into a habitable living space, then Timberwise London can help. By calling 0800 288 8660 or requesting a survey online our team can arrange for a qualified waterproofing specialist to assess the basement and provide the best basement waterproofing specification possible.